Okay so no turkey for me on Thanksgiving, well actually I did have some but it's not the same when it's not either mom's or grandma's. No instead I got the joy of working and in my business there are no holidays and no holiday pay, not even time and a half. As much as I enjoy what I do (working with my hands) I have my moments where I hate my job just as much (keeps me from my family way too much). For those of us that actually love to spend time with family it is really frustrating when you can't, especially when you know the 'whole' family will be there. Even more depressing is when you get to see others the entire day either with their families or hiding from them. But enough of that, the positive outlook is that I'm thankful and to tell you why I am thankful will be my small way of enjoying this holiday. I am thankful first of all that I have an awesome family to miss during the holiday and I am thankful that I have a good job that pays well - even though I have to work on the holiday; I am thankful that I have such cool co-workers who although they feel the same as I, they still try to make the best of it and have a good day; I am thankful that my husband & I are healthy and capable to give our daughter the best of us; I am also thankful that I have a place where I can sit, relax, and contemplate my life after a long day. 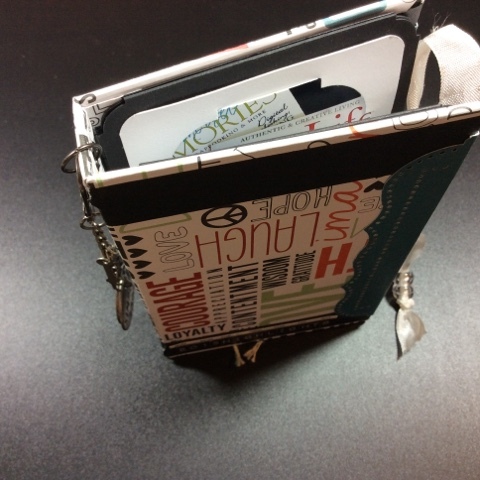 What I have here is the mini book that I did @ the CKC Expo in October. This was the first class of our day and well I did finish this a couple of weeks back but have been so busy with vacation and now trying to get Christmas cards done that I simply forgot that I had not posted it yet. I figure today was a great day for this because it represents 2 very important things in my life that I am absolutely grateful for and absolutely proud of. I have yet to fill in the blank lines (surprise surprise) but that's only because I really want to think about what it is I want this mini to say about us and our family. It is such a simple book but has a ton of meaning already, simply because of the photos. I want 'what' I say to be just as simple but with heart.